AVCHD stands for Advanced Video Coding High Definition. It is a format for digital recording and playback of High Definition Video. 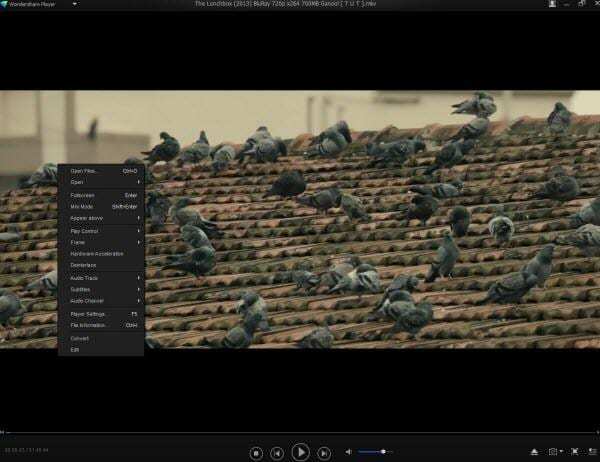 It records 1080i and 720p signals onto certain media using highly efficient codec technologies. It was jointly developed by Panasonic and Sony. In 2006, the companies developed AVCHD for use in high definition consumer camcorders. In 2007, both Panasonic and Sony released the first consumer AVCHD camcorders. In 2011, the AVCHD specification was amended to include two new modes – 1080-line 50-frames/s and 60-frames/s. The newly declared modes require double the data rate than previous modes. By using AVCHD format, you can burn high definition video to a standard DVD disc. Later you can play that DVD disc in a Blu-ray disc player. Thus you don't have to own a Blu-ray disc burner to enjoy high definition video on Blu-ray disc player. AVCHD video can also be outputted to TV via an HDMI cable or components outputs. It can also be transferred and viewed to computer. Part 1. What's in the avchd file? AVCHD uses MPEG – 4 AVC/H.264 standard for video compression which supports a variety of standard, high definition, and stereoscopic video resolution. It supports both Dolby AC-3 and uncompressed linear PCM for audio compression. An AVCHD file consists of recorded audio and video with subtitles and other ancillary streams. These are multiplexed into an MPEG transport stream and stored on media as binary files. For file system, memory cards and HDDs use FAT and optical discs use UDF or ISO9660. Apart from some differences, the file system of AVCHD is derived from the Blu-ray disc specification. For example it utilizes legacy 8.3 file naming system while Blu-ray disc uses long filenames. AVCHD supports a variety of video resolution and scanning methods but most of the camcorders support only a handful of the video and audio formats allowed in the AVCHD standard. Interlaced Video: AVCHD supports both AVCHD-SD or Standard Definition and AVCHD 1080i or High Definition interlaced video while AVCHD 1080i is available with most AVCHD camcorders. Progressive-scan video: AVCHD supports 720-line progressive recording mode at frame rates of 24 and 60 frames/s for 60 Hz models and 50 frames/s for 50 Hz models. Most of the AVCHD camcorders use Dolby Digital (AC-3) compression scheme and stereo and multichannel both audio is supported. Audio data rate changes from 64Kbit/s to 640Kbit/s but practically 256 Kbit/s and 384 Kbit/s are mostly used. It includes an AVCHD decoder in its libavcodec library that is used by ffdshow, a free and open source collection of codecs for Windows. It is actually an H.264 decoder but can also decode AVCHD as well as some other H.264 formats. It uses libavcodec to decode AVCHD on Linux, BSD, OS X, Windows and Solaris. Use the supplied high definition HDMI cable to connect your camcorder with the TV. Turn on the TV. Change the video input on your TV to the same terminal on which you connected the cable. Turn on the camcorder and set it to movie playback if required. Click on Import to add video files. Added files are displayed as a medium size icon or thumbnail on the left hand side of the pane. Alternatively you can also drag and drop your videos onto it to add videos. To add multiple files repeat this step. If you need to edit your video click on the Pencil icon the left side of the video file or right-click on the video and select the editing option. Skip this step if you do not need any edit. Click on the Menu tab. There you will find an option to download additional templates if you don't find any suitable template for your video. After that you can do some additional task to finalize your DVD like adding background music, writing some text on your menu, change your chapter thumbnail and many more. Go to the Preview tab to preview your DVD just before burning it onto a DVD disc. Make sure all the effects have been taken place as you wanted. Finally it's time to burn your disk. You can burn disks or save ISO image and create DVD folder. Choose TV standard: NTSC or PAL in option. 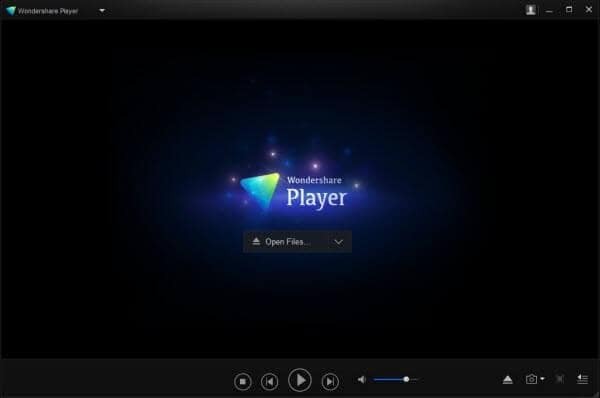 Download Wondershare Player from the official website of Wondershare and then follow the onscreen instruction to install it on your computer and Launch the player. Press F5 to change the default settings. Settings are categorized under the Head as General, Play, Associations, Hot Key, Snapshot, Updates. To add a video file you can directly drag and drop that file onto the playlist or click Open File to navigate to the location where your video resides, then click the target file to open it. While you video is being played you can control the playback. Right click on the pane and a control panel will appear. 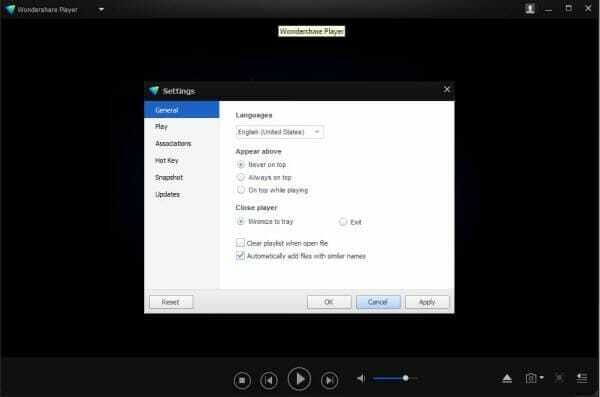 From there you can control the play, add subtitles or open another video file. Hovering on the top will cause a control bar to pop up. From there you can choose a full screen, half screen play and more. Provides 30x faster conversion than any other conversion tools available in the market. It can convert a video file to virtually any format. Can transfer the converted video files to other device using Wi-Fi network. Can burn video files to DVDs. 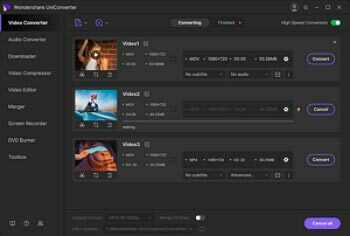 Can also edit video file before conversion. 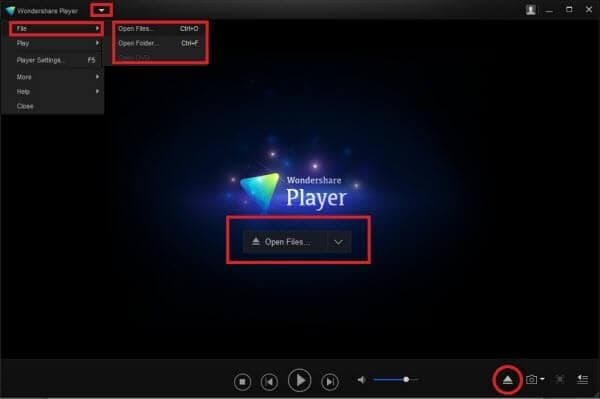 It can also download YouTube video with just one click. Let's see step by step procedure to convert an AVCHD files to other format. Download it and follow the on screen instruction to install Wondershare UniConverter (originally Wondershare Video Converter Ultimate) on your computer. When the installation is complete open the converter. Select the Convert tab and then add/import files in two different ways. First way is by clicking on the Add files button at the upper-left side or at the middle of the software pane. A new Open window will appear. From there you can browse to the location where your file resides and then choose file and click Open. The second way is even easier. Just open the directory containing the video file and then simply drag it from the directory and drop it to the software pane. You can also add multiple files simultaneously. Now you will need to choose the output format of your preference. You can do this by clicking the Output Format drop-down list at the right side of the pane. 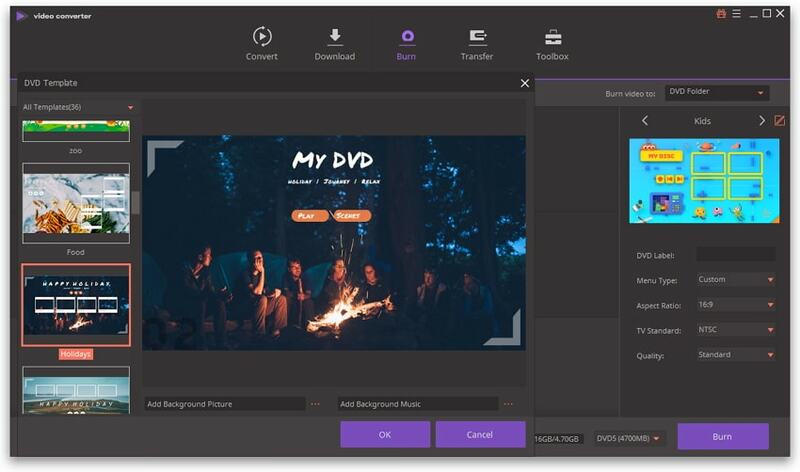 Wondershare UniConverter (originally Wondershare Video Converter Ultimate) supports a wide range of format to convert your AVCHD video file. You can also convert your video files for a specific device type like iPad2, Samsung Galaxy S4, Windows Lumia 900 etc. Now you will just have to click on the Convert button at the bottom-right corner of the screen. Wait until the conversion is complete. Time to complete the conversion will always depend on the size and number of files that you are converting. Once the conversion is complete you can find the location of the converted files by clicking on the Open Folder button at the bottom of the screen. You can also change the location from there before the conversion.